If you follow me on social media, you may well have noticed I'm currently a wig wearer. I wear them almost every day, but have held off from answering too many questions until I'd had a bit more experience! So here is one of my first "Wig Advice" posts trying to answer all of the questions I've been receiving about them! I'm going to share some of the wigs I'm wearing currently, where I bought them from, and what I think of them. I'll show how they arrive, and how I style them for reference. This blonde and brown wig is a cheap one from amazon, and is currently available for less than £15. As you can see I cut the length and the fringe. I was really impressed with this wig, especially for the price. If I could change anything I'd rather there was less brown under the fringe, but such is life! 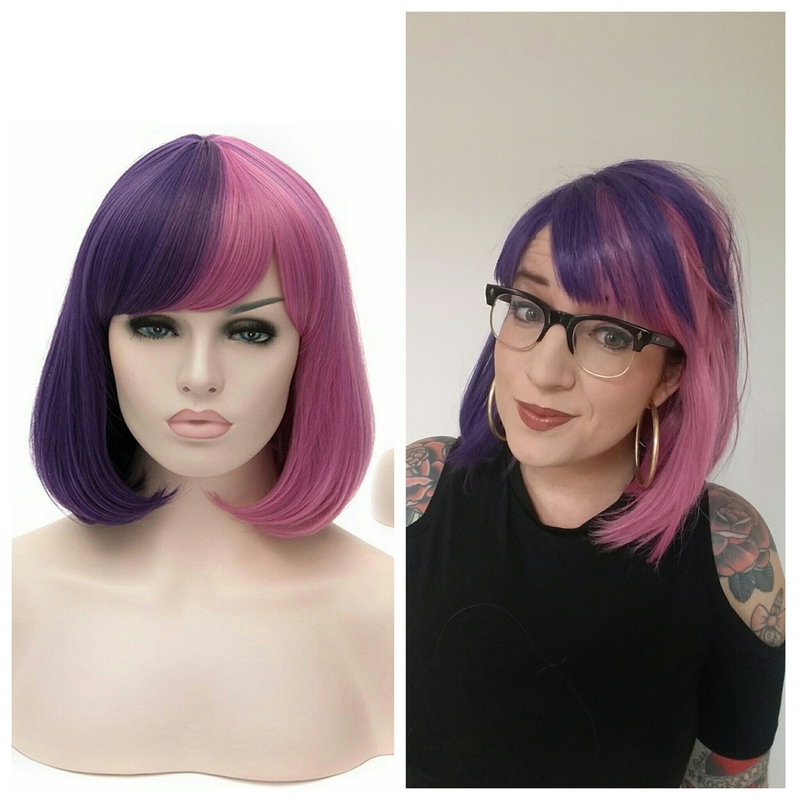 This pink/purple/black wig is from Zella Rose Wigs and it's currently £26 + postage. Again, I cut the length, and took weight out of the fringe. This is currently my favourite day-to-day wig. It's pretty natural looking (because I have black hair underneath) and really comfy. This is a another cheap wig, again under £15 from amazon. I straightened the ends and trimmed the fringes. It is a cheap wig, which means it doesn't sit perfectly, and is a little thin, but definitely wearable as a starter wig. I'll probably trim the ends to thicken it up. This one is a more expensive wig, from Webster Wigs, and was £60. The extra money buys a lot more hair for your cash, and this is thick and luscious. I cut the widows peak off, cut in a fringe, and cut some length off. The thickness means there's even more to get tangled, but this is worth the effort. This is a lace front wig. The others in this list are not. Lace front and more expensive wigs usually get you a parting. The cheaper wigs, and the non lace front wigs don't usually have a part, and gives you that wig shape when sat on the head. This Amazon wig was under a tenner so you have to keep expectations low! Making wigs less shiny is a large part of the wearing-them-in process, and this wig I think could still make a little progress. I've cut it in a bit, powdered it to lessen the shine, and switched the parting. A fun bargain but you can't expect miracles! Another Zella Rose wig, which (I got in the sale). This was always going to be a rather silly wig, and not a 'believable' one. If you're looking for a more believable wig, you want to get more than one tone, so dark roots do this, or multi-colour strands. However not all wigs need to be believable! I'll certainly continue sharing my ever-growing wig collection (I have more!) and more tips and faqs about wearing wigs regularly, so do keep asking your questions via social media! Week 2 at the gym - body combat!